SureAI for creating an excellent conversion! All the people who researched and shared the console commands on other sites! MySelf for creating the BAT files! CONSOLE COMMANDS - added tmm, fov, help, showracemenu, lock, and unlock - all tested to work! This is for Enderal English version! Sometimes what you need, just isn't attainable! I have done all the hard work for you, all you have to do is download! 1. Click download manually, and the file will be downloaded to your specified location. 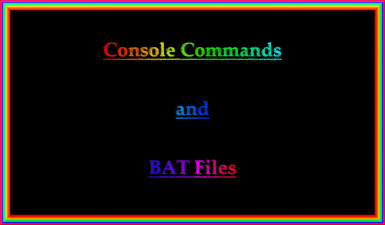 This is for your personal convenience, how you choose to use the commands and bat files is solely up to you individually, but I recommend that you only use these commands sparingly. Since Enderal uses the same engine as TESV: Skyrim, we could presume that the console works just the same. For the most part several of the commands that are used for TESV: Skyrim, actually do work for Enderal! At the same time, several commands are also NOT compatible with Enderal. So as I confirm more working Console Commands I'll update the file and re-upload, check the change log and keep track of the version! supposed to work, and could possibly cause issues in game, or even cause CTD’s. in how you use the information provided, just know you have been warned. without the use of mods.